I inherited my love for hockey from my late mother. She loved those Chicago Blackhawks of the 1960's. Fast forward 40-ish years and I am fortunate enough to be writing about the Blackhawks of tomorrow, also known as the Rockford IceHogs. Thanks to the hospitality and consideration of the IceHogs organization, last Sunday, I was once again ensconced in hockey greatness. 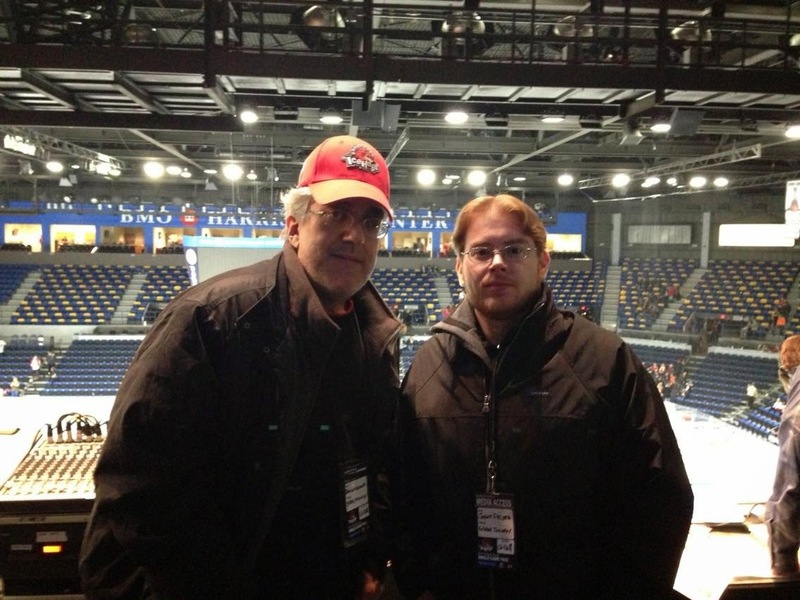 This time, Jason and I sat in the auxiliary press box. I don't care if we sat in the scoreboard. I was just ecstatic to be there. As usual, I wrote about the game for the Patch. That story can be found at Rockford IceHogs Beat Local Rival Chicago Wolves. In short, the IceHogs won 4-2. The IceHogs looked quicker and stronger than their rival Wolves. With two games remaining this year, the IceHogs will head into 2015 in first place. Rockford is an underrated city about 90 minutes west of Chicago. I have enjoyed fine meals at Dos Reales, Old Chicago and (most recently) The Stone Eagle. I have had nothing less than excellent meals. That can also be said about the concessions at the BMO Harris Bank Center, where my favorite is the pulled chicken sandwich. I really cannot wait to return to Rockford. I would go to every game if I could. I highly encourage every hockey fan to check out the action. To learn more about the IceHogs, go to IceHogs.com. Jason Fleigel and me in Rockford, IL-December 2014.